Pitmaston Pine Apple is an 18th century English apple, best-known for its distinctive pineapple-like flavour. It is thought to be a seedling of Golden Pippin, and certainly appears to have inherited the fruity flavour of that variety. The apples are very small, not much bigger than crab-apples. Please fill in the details below and we will let you know when Pitmaston Pine Apple apple trees are back in stock. Pitmaston Pine Apple is in flowering group 4. Pitmaston Pine Apple is self-sterile and needs to be pollinated by another tree of a different variety nearby. Pitmaston Pine Apple is generally easy to grow. It has a reputation for variable cropping, but in a good year qualifies as a heavy cropper. Pitmaston Pine was raised by Mr White, the steward to Lord Foley of Witley in the 1780s. 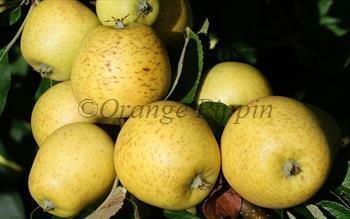 It is a seedling of Golden Pippin, a popular English apple of the period. It was introduced by Mr Williams of Pitmaston near Worcester.